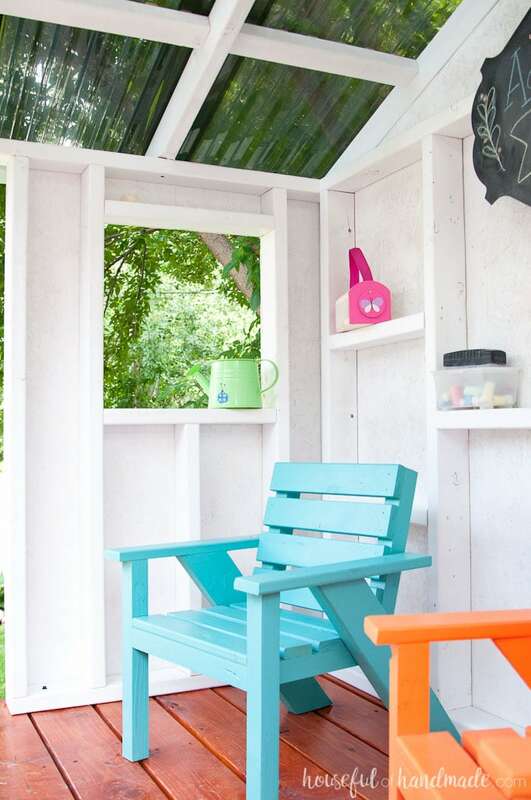 Learn how to build a DIY playhouse. 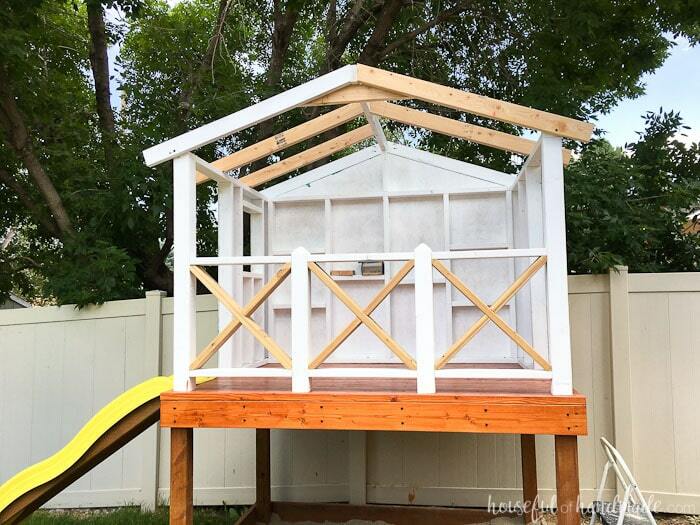 This week we have all the details for how to roof the outdoor playhouse. The DIY Playhouse is all done! This week we completed the roof build and now our kids have the perfect place to play, even in the hot sun. The roof material we chose blocks the harmful sun rays but still allows lots of light into the clubhouse. And now the kids can play outside in any weather. 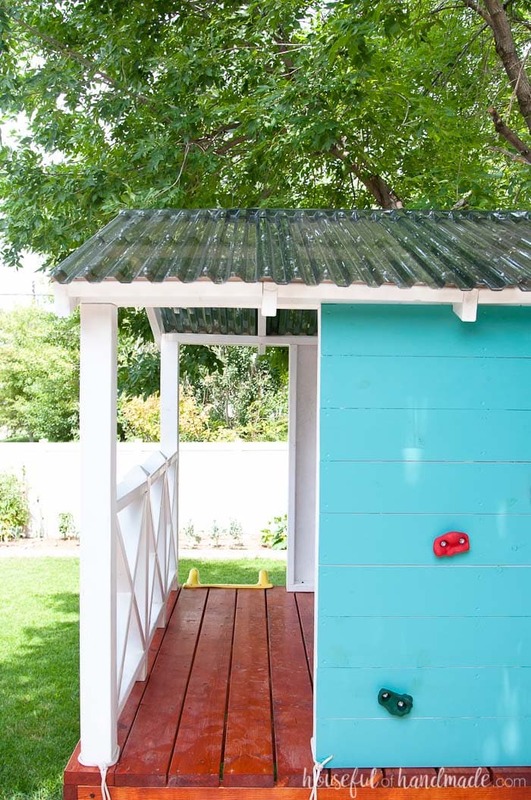 Now we have all the kids playhouse posts ready for you to build your own outdoor wooden playhouse! I was starting to feel like the kids outdoor playhouse was never going to be finished. July was a crazy month. And after waiting for the final roofing piece to arrive in the mail, we just had too much going on to get the roof build complete. But after a couple strong summer rainstorms, I decided it was time to make the roof a priority. 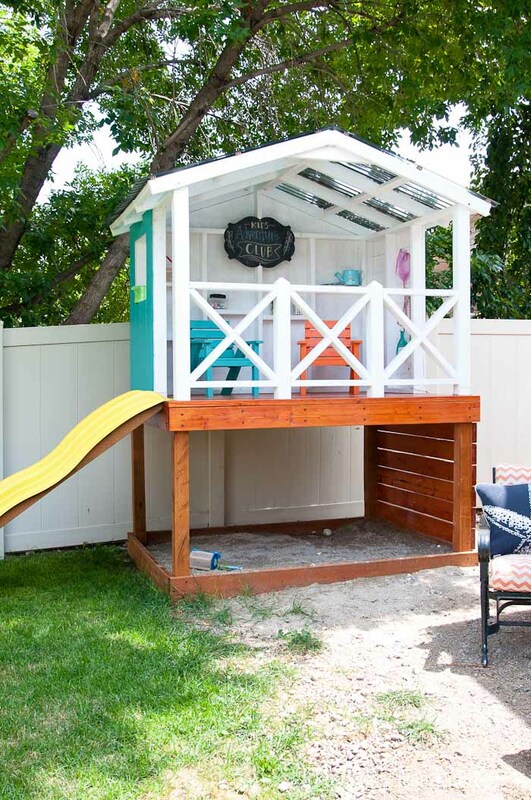 I’m so glad we did because the new roof is definitely the icing on the cake for the perfect outdoor DIY playhouse! There were many different options for roofing the playhouse. 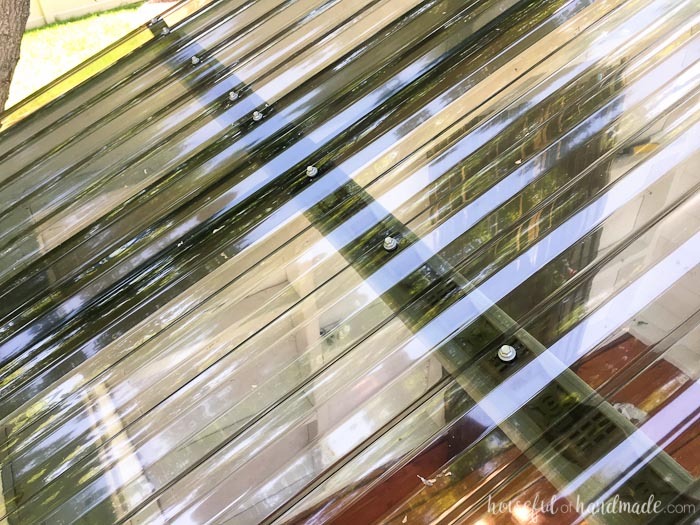 We considered so many different options before finally settling on using the Suntuf corrugated polycarbonate roofing panels from The Home Depot (this is not a sponsored post, I just really love this product). These roofing panels were not the least expensive option, but the pros of using them outweighed the cost. 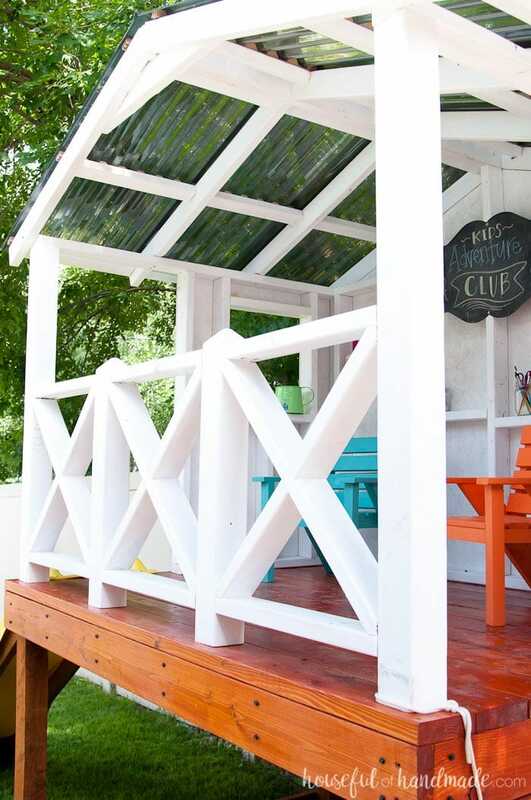 They block 99% of harmful UV rays, which will not only protect the kids in the playhouse, but also protect the actual playhouse so it lasts longer. They are super easy to install (minus the almost falling off the ladder part). And the Solar Gray color gives the whole house a shaded feel so it stays cooler in the hot months, but still allows 70% off the light in. Once we had decided on what we would use to cover our playhouse, we needed to build a roof to support it. I am not going to lie, building a roof scared me. But it was actually really easy to do! The roof build did require two sets of hands. I couldn’t hold the boards how I needed them by myself and clamps were not an option. But with my husband’s help, we had the roof frame built in a morning (except for one board that was mis-cut and required a trip to get more wood). After the roof of the DIY playhouse was built, adding the Suntuf panels was quite easy. It did require a bit of balancing on a step stool and ladder, but was really easy to do. So easy I am planning on using them again on another project soon! 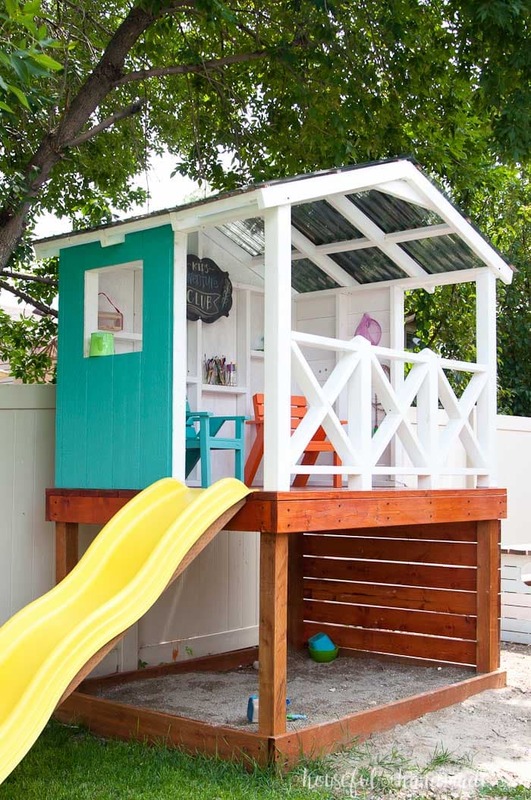 I absolutely love that the roof covers the entire playhouse deck. It will help protect all the kids toys during the winter. And the wood will last longer since it will be protected from the weather. The kids feel so special with their own space to enjoy. They even asked for a broom for their playhouse so they can keep it clean. And don’t miss the rest of the posts in the series. Click the links below for the rest of the playhouse build. I used my miter saw to cut all the 2x4s, but you could also use a circular saw for this. I recommend starting with (2) 12″ bar clamps. They are super helpful and will do everything you need to build this playhouse. I used the Solar Gray color to give a bit of shade to the playhouse. 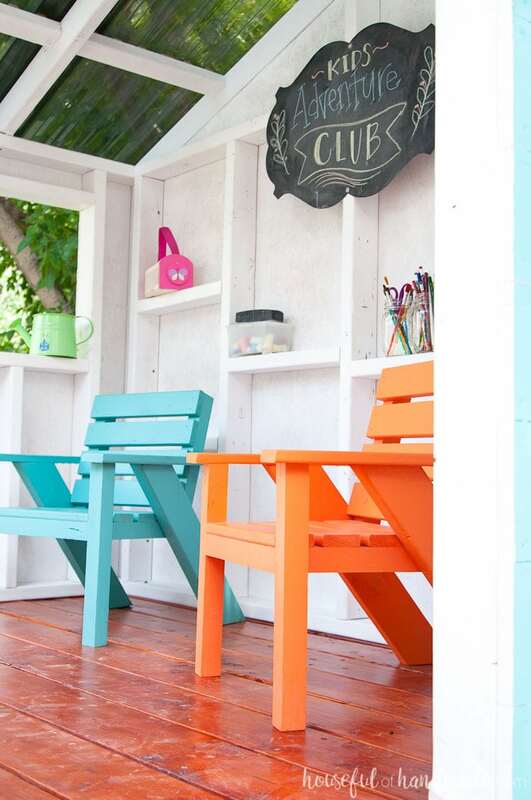 I used Ultra White by Behr for the roof of the DIY playhouse. 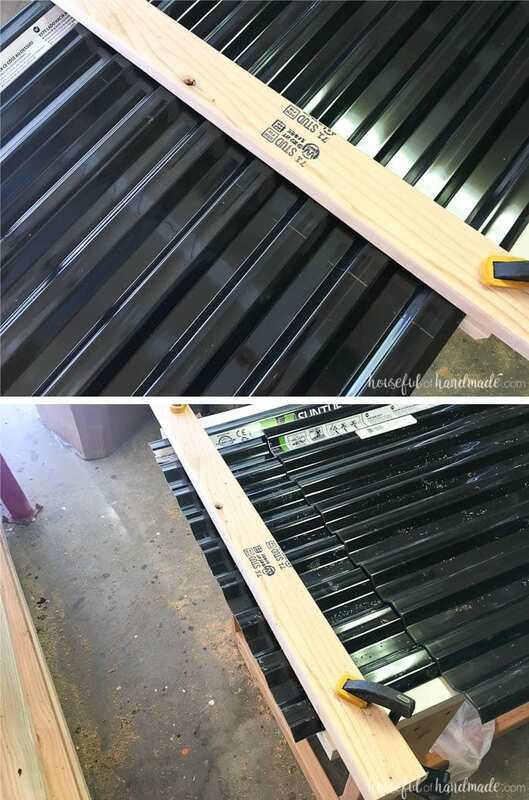 Cut 1 piece of 2×4 to 63″. This will be the roof ridge. 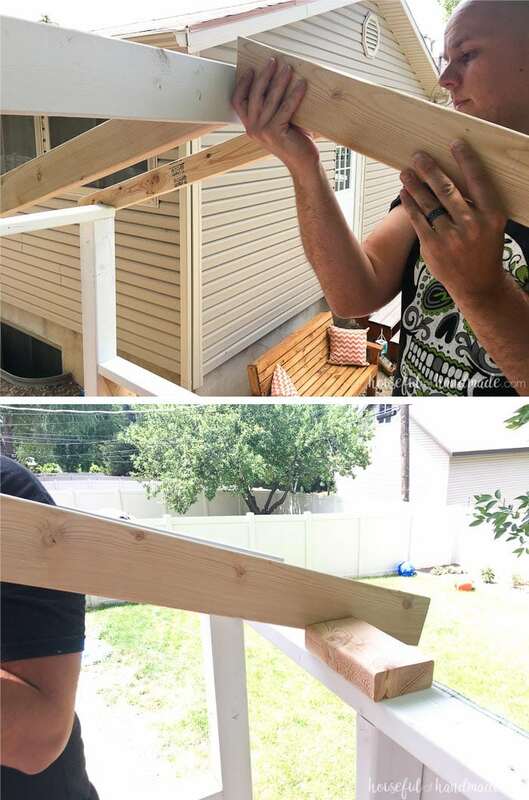 Cut 8 pieces of 2×4 at 48″ with a 19 degree angle cut off one end. These will be the roof rafters. You can paint the roof pieces now to make it easier. I pre-painted half of mine with my FinishMax paint sprayer and the others were easy to paint once installed. 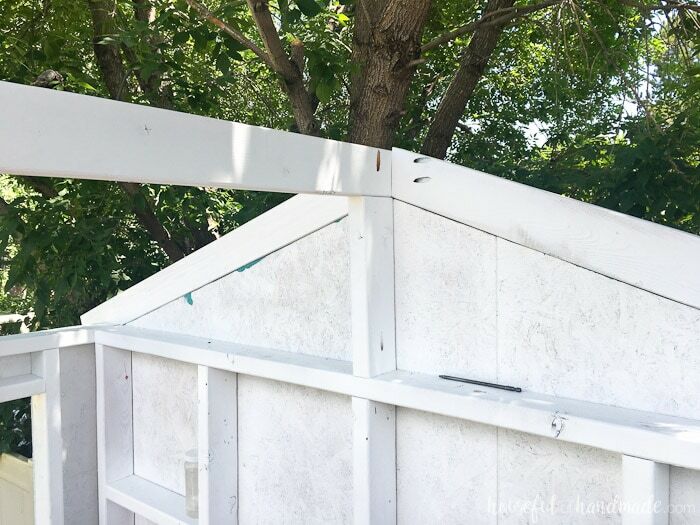 Measure 1 1/2″ in from the back of the roof ridge piece and make a line. Measure 3 1/2″ in from there and make a second line. Drill 3 pocket holes in between these two lines so it can attach the roof ridge to the center wall stud on the back wall. I drilled 2 on one side and 1 centered between them on the other side. Drill 2 pocket holes in the angled side of each of the roof rafters. 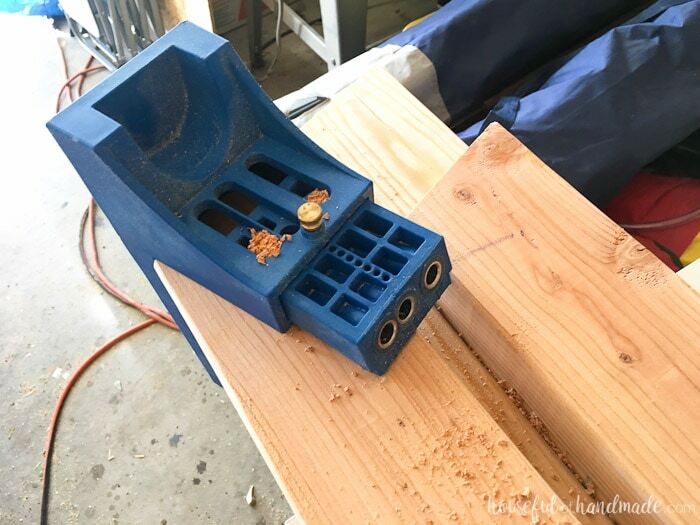 Remember these will be mirrored when installed so pay attention to what side of the wood you add the pocket holes so you don’t end up with them showing on the front of your DIY playhouse. 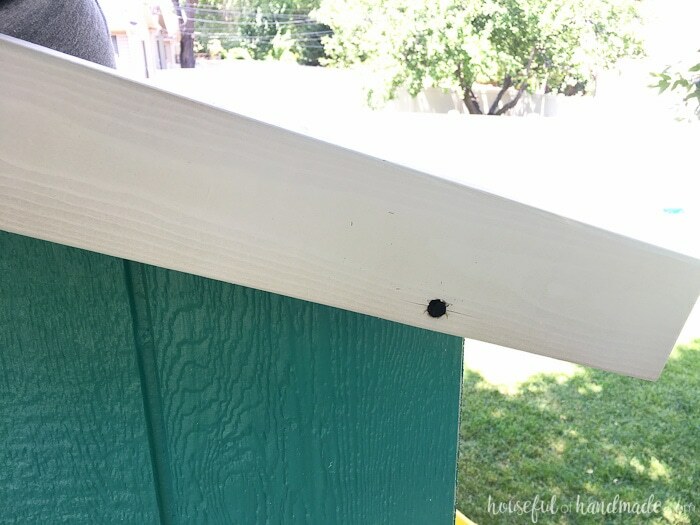 Attach the roof ridge to the top of the center wall stud with 2 1/2″ pocket hole screws and exterior wood glue. Make sure there is 1 1/2″ overhang on the back side. Then attach two roof rafters to either side of the roof ridge so they are flush with the back of the ridge. The rafters should sit right on top of the wood paneling on the outside of the back wall. Secure the rafters to the side walls with a 2 1/2″ wood screw. Then repeat with the rafters on the front of the playhouse. Cut the piece of 2×4 left over (after cutting the 63″ roof ridge) so it fits right under the ridge on the front of the playhouse. Secure it to the front roof rafters with 4 of the wood screws. This will help support the front of the roof since it is completely open. Before securing the rest of the roof rafters, you will need to notch out a spot for them to sit on the side walls. The easiest way we found to mark these notches was to hold the rafter 1 1/2″ up from the bottom of the ridge. Then with the rafter resting on the side wall, sit a scrap of 2×4 next to it and trace the notch. Cut out the notch with a jig saw. 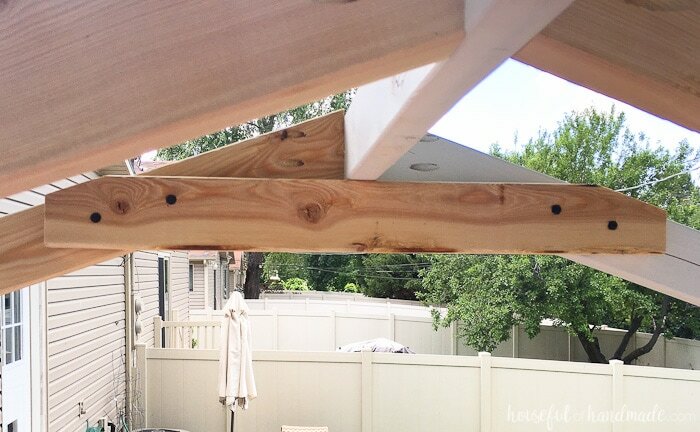 Attach the notched rood rafters to the ridge with 2 1/2″ pocket hole screws. 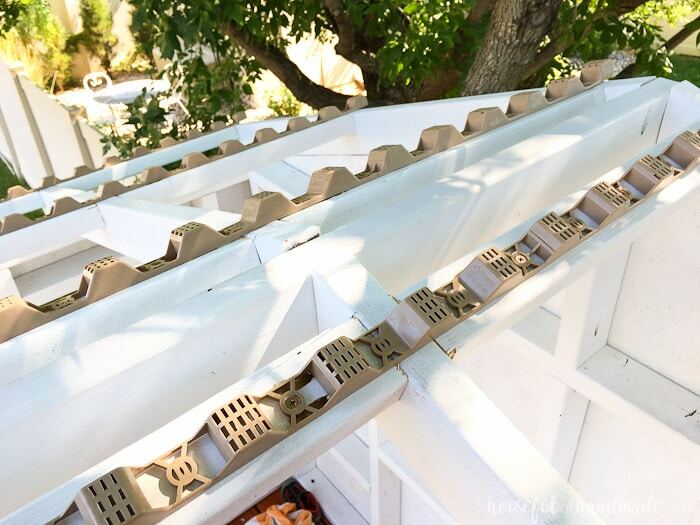 Then attach the notched part to the side walls with pocket hole screws or left over decking screws, up through the stud on the top of the wall into the rafter. To attach the Suntuf corrugated roofing to the newly built roof, you will need to add some 2×3 cross supports. You can just cut the 2×3 to 63″ and lay them on top of the roof rafters every 2′. But I didn’t want the roof to be raised up above the rafters so I chose to cut the cross supports so they fit in between the roof rafters. Each cross support had to be measured to fit because the 2x4s weren’t perfectly straight. I used 2 pocket holes on either side of each 2×3 cross support to secure them to the rafters. Now it’s time to add the roof! 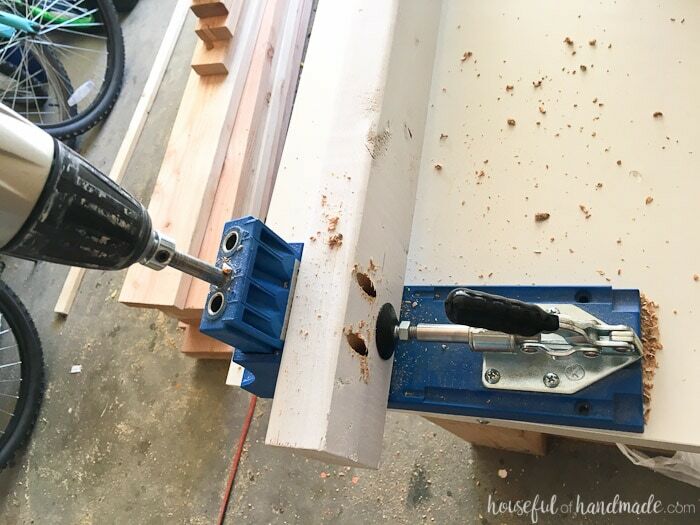 Attach the horizontal closure strips to the cross supports with the 1 1/2″ wood screws. Cut the closure strips as needed with tin snips (they are plastic and super easy to snip where needed). Cut the (3) 8′ panels in half so you now have (6) 4′ panels. Clamp all the panels together and use a piece of scrap wood as a guide to keep your circular saw straight while cutting. Make sure to wear good safety glasses because little pieces of polycarbonate will fly everywhere when you cut it. To attach the roofing panels to the roof, start on the back of the roof. You can easily reach it with a step stool in the playhouse and stepping up through the rafters and cross supports. 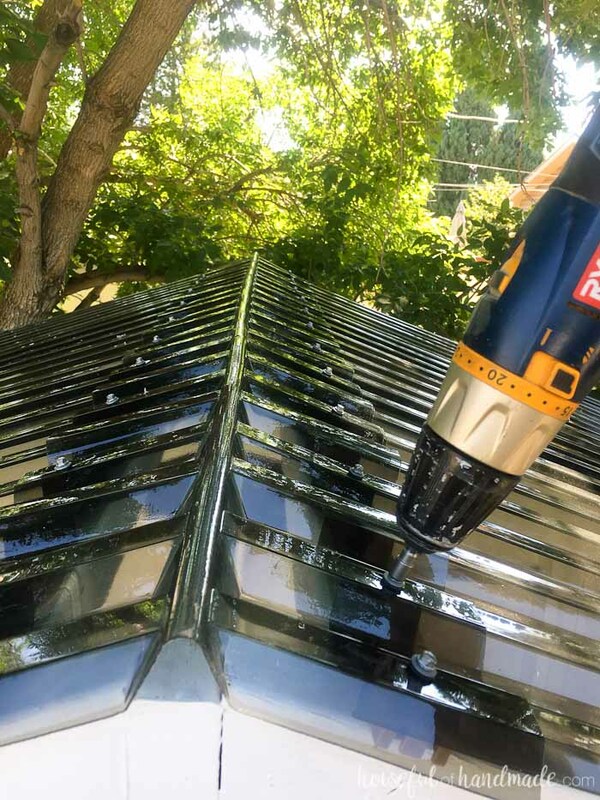 Pre-drill through the roofing panels with a 1/4″ drill bit, then carefully attach the panels with the Woodtite screws. Make sure the screws go in at a 90 degree angle to the roof and they are not over-tightened. Use a drill that can be set with a lower driving setting instead of an impact driver to do this. You do not want to see dimpling in the roof where the screws are attached. Overlap the roofing panels so they all fit (I believe the back panel was overlapped 2 ridges and the front was 3 ridges). Secure the panels withe screws in every other ridge, but making sure to put a screw in the edge of each panel (so some areas the screws will not be every other because of how they overlap). Once you have the panels on, it is time for the roof ridge panel. The playhouse was small enough I was able to stretch on a ladder and attach the ridge without having to climb onto the roof. You will overlap the ridge piece on the top of the roof panels and secure to the horizontal closure strips at the top of the roof (closest to the roof ridge). Now you have successfully completed the DIY playhouse roof! I felt the need to pat myself on the back because this what the first time I had roofed anything. It has made me realize I can really take on whatever I put my mind to. The kids really are loving their playhouse. And I can’t wait until they get to go out and play in a rainstorm and put the new roof to the test. It’s seems like the perfect place to enjoy a summer rainstorm to me! I was originally planning $650 for the playhouse. With the slightly more expensive roof, we were $100 over budget. But still, the playhouse cost less than the new iPad Pro and offers my kids way more hours of fun! Hi there! We are building my 6yo daughter a play house as we speak. My husband thinks that the corrugated plastic will crack if a ball hits it or if a limb from tree falls on it. Can you tell me if your has withstood time? Thank you so much! From a husband and wife who can’t agree in KY! We have had no issues with the Suntuf roofing we used. It is very sturdy. We liked it so much we even put it on our large pergola. Hi I’m trying to build this playhouse for my girls, we want it to be 8×8 and I’m horrible at math. How do I figure out the length for the roof rafters? If you have already figured out the back walls with the added length, you can just measure from the top support in the wall to the edge of the wall with an overhang. That way you don’t have to remember how to do geometry 😉 Good luck Krys! A shingled roof for a child’s playhouse? How do I attached the shingles without creating the hazard of even short shingle nails penetrating the exposed underside of the roof sheathing? I’ve not encountered roofing nails shorter than 7/8 inches. 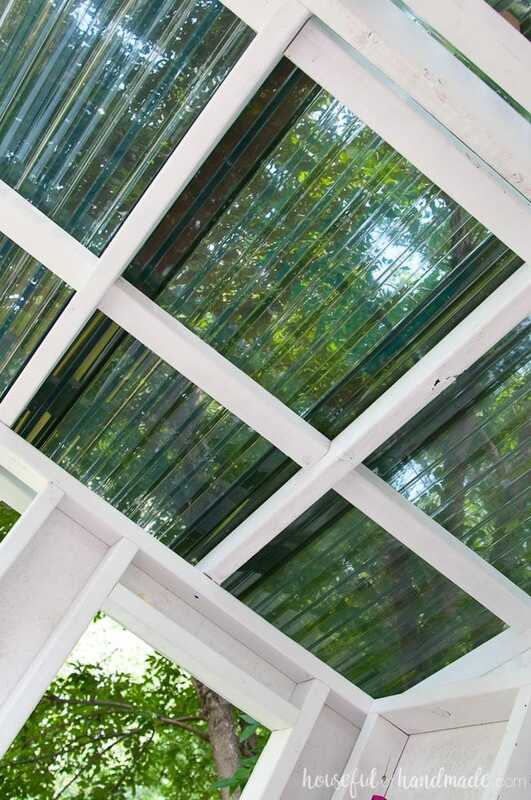 That is one of the reasons we chose to use the polycarbonate corrugated roofing. There is nothing coming through the roof for kids to get hurt on. Also it lets in light so that there is way more play time! If you really want shingles on your roof, you could choose a thicker underlayment. The actual playhouse is 5′ x 7′ but the slide adds a bit. Probably sticks out about 5′ from the side of the playhouse. Hope this helps! I think it is 4 2×3 needed,correct? I am building it. If you want to cut the 2×3 supports to sit on top of the roof rafters you will need 6- 63″ pieces. But since I cut them to sit in between the rafters, I was able to do it with 3 8′ pieces. It is 4 2x3s, we are building it and 3 only gets us 15 pieces about 19” apart. We needed another 2×3 to get us to the necessary 18. Thanks for the correction. I might have had some scraps in the shop I used. I’ll fix that! Enjoy your build! How old were your kiddos/ were they able to climb the rock wall portion? We’re about to start a similar playhouse for our daredevil 4 y.o. with the rock wall on the side. They were able to climb it the year we built it so 4 and 7. They love the rock wall! Good luck with your project. It’s a fun one. Do you have a rough idea of the cost for everything you did? On the second page (under the tutorial) I shared the cost breakdown. It came out to about $760. So cute! I bet your littles just love this! Suntuf is the best hey?! Is that what they call the grey in the Suntuf? I love it! Wow! This is the cutest I have seen! The clear roof is such a great idea! All the colors make this so adorable! What a great job! Thanks Renee! I love the bright colors, they are perfect for the kids.